Here is the National Assembly during its night session to decide on the future of Jocelerme Privert. The National Assembly is a joint session of Parliament convened for specific purposes laid out in the Constitution. 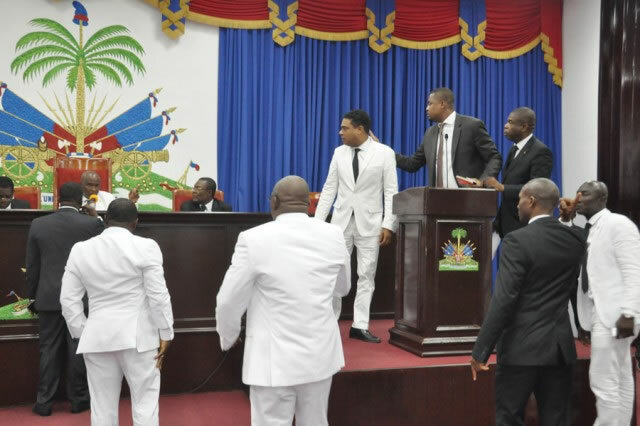 On June 28, 2016, the Haitian lawmakers met in a night session because some of them wanted to involve more members as ministers before they proceed to vote favoring the extension of the term of interim president Jocelerme Privert as the President of the republic. However, when the session finally ended on Wednesday, June 29, 2016 around 4:00AM, the parliamentarians were unable to find a solution because it failed to satisfy the demand of some Senators and Deputies to get their votes.